This Wednesday, The Yale Daily News reported on a panel discussing the "current struggle for Kosovar autonomy." Sure enough, what the panelists "discusses" was just how much the "Kosovars" (sic!) deserved their independence from evil Serbs, and how soon they would get it. "The panel consisted of Yale professor Ivo Banac, University of Pristina professor Dastid Pallaska, 2007 Yale World Fellow Verena Knaus, 2006 Yale World Fellow Garentina Kraja, Laurie Ball LAW ’09 and Jonathan Finer LAW ’09." Let's see... an ethnic Albanian professor (Pallaska), an ethnic Albanian journalist (Kraja), and a former Croat politician (Banac) round out the "Balkans" perspective. To be honest, Banac was probably the most impartial of the lot - but with this lot, that's not hard. Continuing on: Knaus is a member of the "European Stability Initiative," a Brussels-friendly NGO run by Gerald Knaus (husband or brother?). The ESI is funded by numerous foundations and Western governments - and oh yes, NATO! Can't expect someone who ate from NATO's dish to criticize the Alliance for its illegal occupation of Kosovo, now can we? Finally, there is Jonathan Finer, who is actually a Washington Post reporter best known for being "embedded" with the 1st Marine Division in Iraq, but who has recently done a tour of the Balkans and produced a series of predictably propagandistic rubbish about Bosnia, Serbia and Kosovo. Now, according to the Yale Daily News, Law School Dean Harold Koh called “a better briefing than anything presented at the State Department.” I concur - in the sense that the putrid bilge regularly emanating from the State Department is hard to outdo. But I bet these brave panelists came close. Of course, the reporter only quotes Ball, Pallaska, Finer and Knaus; there's nothing at all from Banac or Kraja. But what is quoted is insipid enough. Not surprisingly, there was widespread agreement about the inevitability and even necessity of independence, and the report (presumably drawing from the "information" offered at the panel) spoke of "more than 10,000 ethnic Albanians" killed. Only trouble is, this "fact" is nothing of the sort. In the past, forums, panels and "debates" of this kind at various universities and NGO institutes at least tried to create a pretense of impartiality by inviting a token Serb (even better, an ethnic Serb with a serious case of neo-Jacobin Empire-worship). Now, if this is the state of academic debate , or even discussion, at one of America's most prestigious universities, it's no wonder the American public is so utterly deluded about what is actually happening in Kosovo. Then again, didn't the current Emperor study at Yale? I first met Ron Paul in 2003, at a Mises Institute event in Auburn, Ala. I remember being impressed with him even then - a sentiment that has only grown stronger with time. As I've chronicled the actions of the American Empire over the years, I became convinced that Dr. Paul was that rarest of birds: an actual believer in the American Republic in an age when everyone's embraced the Caesars. The choice is simple. If you want to live under an EU-style regime that is intent on invading and occupying other countries in the name of democracy for the foreseeable future, vote for any of the so-called major candidates. It doesn't matter which one.[...] If, on the other hand, you wish to live in a nation where the United States government is governed by the Constitution, you had better support Ron Paul. This may be your only opportunity, for it is entirely possible that this will be the last time such a choice is presented to you. Many times over the past eight years have I been asked about the actual number of people killed in Kosovo during the NATO campaign of helping the terrorist KLA's separatist agenda. Back in 1999, U.S. officials bandied about numbers exceeding 100,000 and when pressed to provide evidence gleefully repeated rumors of Serb crematoria and corpse-choked mines. After NATO occupation forces entered the province in June, however, the alleged genocide proved ephemeral. Just over 2,000 bodies were found, belonging to Albanians as well as Serbs, Roma, and others who lived in Kosovo, killed by NATO bombs, KLA terrorism, and yes, Yugoslav police and military. The total number of bodies found was 2,788, including both Serbs and Albanians (several mass graves were in fact those of Serbs massacred by the KLA). The International Red Cross is listing another 2,047 persons as still missing, "including approximately 500 Serbs, 1,300 Albanians and 200 members of other ethnic groups." This is a far cry from "an estimated 10,000 people, mostly ethnic Albanians," which is used in every report about the occupied province, including and especially those dealing with the constant KLA terror against the remaining Serbs and other non-Albanians. The repetition is meant to provide a justification for NATO intervention, but it also tends to bolster the bogus case for independence claimed by the Albanian separatists. Little wonder, then, that all the mainstream media keep repeating the 10,000 mantra. Last week, however, a U.S.-based intelligence publication Defense & Foreign Affairs, analyzed the Kosovo death toll fraud, and showed conclusively that the figure of 10,000 Albanians has been a fabrication all along. Every man, woman and child the U.S. forces kill in Iraq is transformed into an "insurgent" by the magic of propaganda. 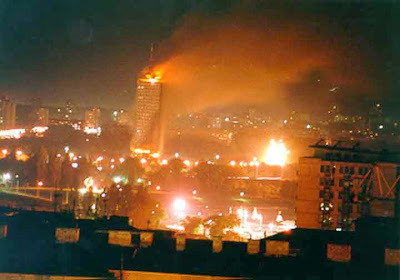 That same propaganda turned every KLA terrorist the Yugoslav forces killed - in battles raging for a year before NATO bombers took the KLA side - into an innocent civilian, then multiplied that number by three, five, ten, a hundred. The same thing was done in Bosnia. In both cases, numbers are meant to override reality. Iraqi body counts are supposed to provide a metric of "progress", covering up the reality of failure. In Bosnia, and later in Kosovo, numbers were meant to provoke outrage, anger and shock, blocking out rational thought and providing cover for aggression, occupation, and support of unsavory client regimes. The greater the deception, the bigger lie it required. Under the umbrella of those lies, the "democratic" authorities in Croatia accomplished what their Nazi predecessors could not, ethnically cleansing most Serbs; Alija Izetbegovic achieved his dream of forcing the Muslims of Bosnia back into Islam, this time of the Saudi variety; and the Albanians of Kosovo have at least temporarily restored the "Greater Albania"of WW2, and set upon eradicating every trace of Serb presence in the land. Trouble is, what would have been possible a century or half a century ago - because who could find out the truth, safely locked away in classified archives? - is not so possible now. The lies are getting exposed after a few short years. Sure, a lot of the damage has already been done, and not all of it can be reversed. But the time between the lie and its exposure has shortened exponentially. And once exposed, it is just a matter of time and willpower before the edifice built on the lies is torn down. And maybe next time - for, given the human worship of violence, there will be a next time - lies won't be so easily believed in the first place.